Vertical Type Wire Drawing & Ribbing Machine a vertical type single drum wire drawing machine.With two sets of pattern rollers, this machine is sultable for steel wire drawing and profiling. As for drawing wire rod, it is also equipped with descaler to save the acid washing process to attain the goal for effort-saving, cost reduction and public harm free. The finished products can be coiled on the wire stand underneath the machine for easy unloading. 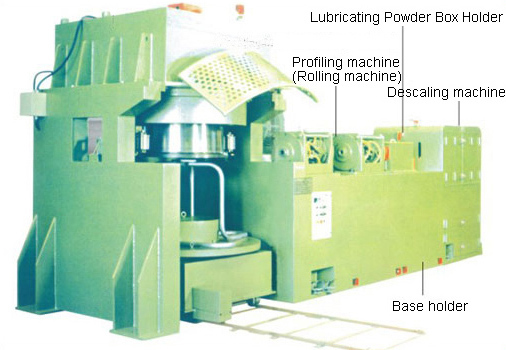 This machine is simple in operation and is equipped with one set of die for interchange with the pattern rollers. 1. Vertical Type Wire Drawing & Ribbing Machine is equipped with an AC motor of 100HPX4P/6P with stepless speed variation in conjunction with a transducer.The gear box uses worm gear for transmission and oil dipping for lubrication. 2. Wire drawing speed is 135 m/min (Max). 4. Diameter of drawing drum is 750 mm and the drawing drum is treated with hot surface spraying welding and case-hardening with water inside for circule cooling. 5. Two groups of wire pressing wheel which is made of SKD-11 heat-treated. 6. The material handling rack is equipped with AC motor of 2HPX4P4P/6P for stepless speed variation in conjunction with the inverter(frequency changer) and linked in proportional movement with the main motor. 7. Brake system: DISCO Brake is used for drawing drum and air brake is used for the material arranging rack. 8. Material rack operating cylinder of which the max. loading is 1300kg. 9. Electrical control system: counter, "Inching" speed adjusting knob, Wire speed Gauge, alarm, fine tuning knob, emergency brake and safety device.